When the temperature drops you need to stay warm, especially at night. Check out the JCPenney collection of cold-weather bedding to make sure you stay cozy for a good night's sleep every night. Browse through the selection of minky blankets, throws, electric blankets, and down-alternative comforters to find your best cold-weather bedding. Save on heated mattress pads, throws, blankets and other cold-weather bedding now and be prepared for the cold weather whenever it decides to strike. A good night's rest can improve your memory and reduce stress, but you can't get a good night's sleep if you're constantly shivering under an inadequate blanket. Check out the JCPenney collection of down and down-alternative comforters and soft fuzzy blankets to keep your space and your nights comfortably warm. Layer up with lighter weight blankets or go with a puffy duvet. JCPenney has all the cozy warm blankets and bedding you need. You will be amazed at how cozy and inviting heated blankets and heated mattress pads can be. Plus, you'll save money on energy by keeping your thermostat low and adding a thick, warm comforter or duvet to your bed. 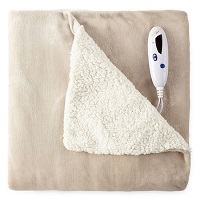 Look for JCPenney's electric blankets available in many colors and fabrics including fleece, microplush, and reversible sherpa styles. Turn down the thermostat and cuddle up under warm faux-mink blankets, comfy throws and other cold-weather essentials from JCPenney. Warm up to winter with JCPenney's printed seasonal sheets and sheet sets. Warm heavyweight flannel sheets feel soft and comfortable. Look for the whimsical holiday prints to bring a smile to your face or make bedtime more fun for kids. Flannel sheets with snowflakes and spruce trees are warmer than they look! Snuggle into these affordable flannels and sleep well. Available in cotton, microfiber and moisture-wicking varieties, mattress pads and toppers are often stuffed with polyester fill or memory foam, and can fit securely over even the deepest mattress without you having to worry about it coming off. Heated mattress pads are low-voltage and are often fitted with timers and automatic shut-offs so you can choose how warm you want to be. If you're looking to add softness to your mattress or add some support to a mattress that's too soft for your needs, a mattress topper can do all of this and help reduce muscle stiffness and joint pain. Both mattress pads and mattress toppers go a long way toward protecting your bed from everyday wear and tear so you can get the most out of your investment. Get one of each at JCPenney to increase your comfort and maintain warmth through those long cold winter nights. 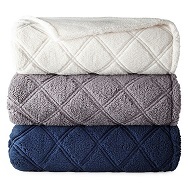 JCPenney's collection of soft plush blankets and down-filled duvets mean it's easy to stay warm this winter. 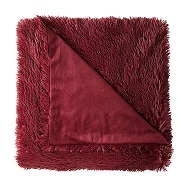 An affordable plush or fleece blanket will last for years and ward off the chill for years to come. Browse our selection of electric blankets, comforters, quilts, and more to find the one that suits you best and will keep you warm all year long.